Canon has announced the latest addition to its PowerShot range, with the PowerShot SX210 IS offering 14.1MP resolution and DIGIC 4 processing. 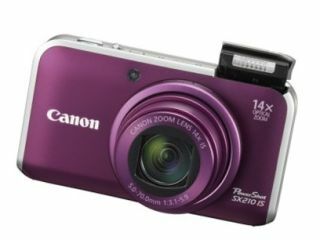 Canon is pitching the PowerShot SX210 IS for 'users seeking powerful performance in a highly compact body', featuring a 28mm wide-angle lens and 14x optical zoom. The camera also boasts 720p HD video recording functionality with zoom and stereo sound. Plus the SX210 IS offers Canon's Scene Detection Technology, i-Contrast , Smart Flash Exposure, Motion Detection Technology and Face Detection Technology for up to 35 faces. The PowerShot SX210 IS has a UK release date of March 2010 priced at £359. Go to www.canon.co.uk for more details.